Last January, Linton Hopkins and I were in my kitchen setting up for his Monday class as part of the Serenbe Southern Chef Series. He and I were chatting about the Southern Foodways Alliance- a great organization dedicated to preserving the history and flavor of Southern Culture. 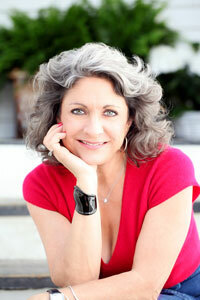 I had wanted Serenbe to partner with SFA to create a benefit for one of their programs. 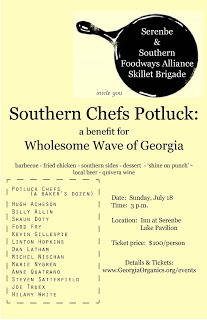 From that conversation and several meetings later (which included Angie Mozier- she and I had created the original Les Dames event at Serenbe 9 years ago), the Skillet Brigade and Serenbe are hosting an event on July 18 with some of Atlanta’s top chefs-a Baker’s Dozen- to raise money for Wholesome Wave, a truly wonderful program. It seems a great way to spend a Sunday afternoon in the country- delicious food, beautiful scenery and a crazy bunch of chefs. Hope you can join us!! Click Southern Chefs Potluck to see the flyer in detail. For details and ticket purchase, click Georgia Organics.